The second day of a three day carp fishing trip for Matt, Stephen and Ashley in Thailand saw the UK carp fishermen once again fishing at Bungsamran Lake in Bangkok. After catching a Giant Siamese Carp on the previous day the anglers quickly loaded large cage feeders with Jaffa sized balls of groundbait before gently casting close to the marginal snags. The morning began in much the same fashion as the previous day with action falling to all of the anglers from the super hard fighting Mekong Catfish. Throughout the morning the anglers enjoyed great sport with a series of Mekong Catfish and Striped Catfish testing their stamina to the limit. Fishing multiple rods the anglers watched as several carp crashed over the baited area causing plumes of bubbles to erupt on the surface of the swim. With baited breath the anglers waited as the carp activity increased causing the lines to flicker as unseen monster carp fed actively over the heavily baited area. Moments later all hell broke loose as the braided mainline began to evaporate from the spool of the reel. Quickly engaging the clutch on the reel saw the rod violently hoop over as it took up the full weight of the carp. A gigantic swirl formed on the surface amongst a mass of bubbles as the carp was turned from its initial run. Large waves emanated from the swim as the carp used its rudder like tail to power back down into the murky depths of the lake. The carp embarked on another powerful run stripped several yards of line from the tightened spool. Ashley applied as much side strain as humanly possible once again turning the fish from its fast and determined run. The giant carp immediately responded by heading at high speed towards the sanctuary of the snags requiring the angler to reel frantically in order to pick up the slack in the braided mainline. After regaining contact with the Giant Carp the angler piled on the pressure to keep the carp out of the underwater snag putting the rod into its full fighting curve. Several more fraught moments followed which saw the fish ploughing angrily up and down the margins. 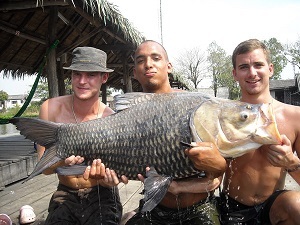 The Giant Siamese Carp was finally netted by Nok and hoisted onto the unhooking mat. The monster sized Giant Siamese Carp was estimated to weigh 40kg’s and was observed to be a big fish with a very deep and broad body. After a series of trophy shots were snapped off the elated anglers returned the fish before congratulating the angler on his capture.